xD They all look sooo hot!! HAHAHH!!!!! 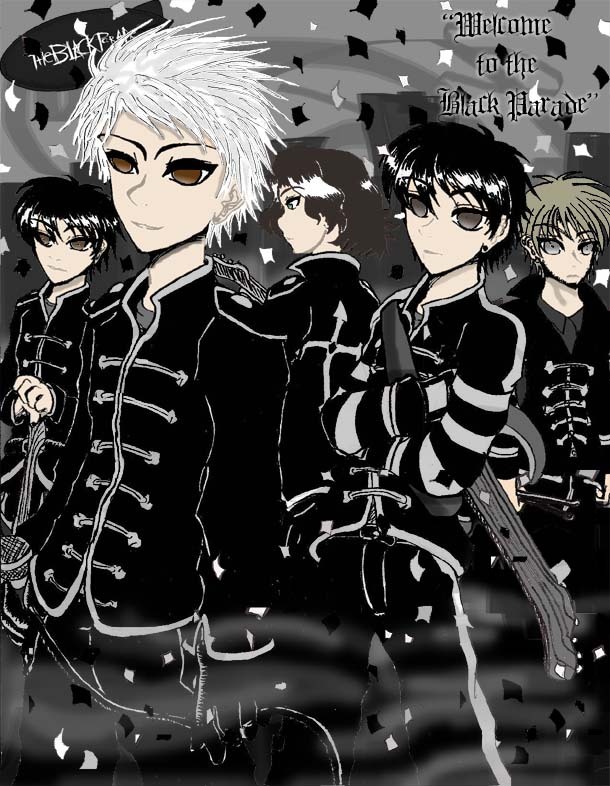 AWWWWWW AWESOME I LUV MY CHEMICAL ROMANCE THEY LOOK EVEN CUTER ANIME STYLE HEHEH FAVZ!!!! I LUV THE WHITE HAIRED ONE HIS STYLE IS AWESOME!!!! Awesome! Those guys are incredible! And so are you! wow!!!!!!!!!! I'm a huge fan of ders and tis pic tis awesome!!!!!!!!! !.....why r u so good at drawing?? Wow, that's amazing. Possibly the best MCR anime I've ever seen. And I've seen a lot, trust me. Cause my life is that full. Hey Solo! I missed you! I really liked what you did with MCR! n.n Hey, did you ever get finished coloring that piccy for me? Just curious. MAN! AT YOUR PARTY YOU GUYS GOT ME HOOKED ON THAT SONG! IT'S YOUR FAULT! YOU ARE MAD!!!! Cool that music video was sooooooooo awsome!!! Great Picture. The mist is a nice touch. I love it when people take real people and make them look anime you did a great job.